Meshack Kekana was selected out of 500 nominees as part of the top 4 South African Risk Influencers of the year 2018. These are all the individuals who are making positive changes on a national scale. At age 23, Mr Kekana was the youngest nominee in the history of the awards. 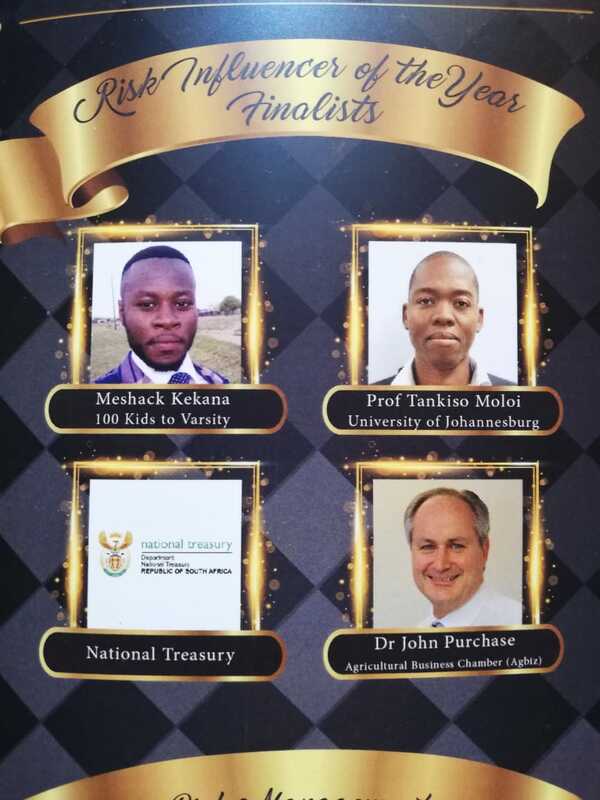 #100KidsToVarsity, Mr Kekana's non profit organization, started during his third year, was selected as a finalist for the 2018 Institute of Risk Management South Africa. Out of the over 200 companies that were nominated, #100KidsToVarsity was in the Top 5 finalists under the education category. Mr Kekana (CEO), Timothy Hlongwane (COO), and Bokang Molatlhwa (CFO), represented the organization at the gala dinner held on Friday 9 November at the Theatre on track, Midrand Pretoria. The Department of Biochemistry, Genetics and Microbiology is very proud of this Masters student. May many follow in the amazing example he has set.